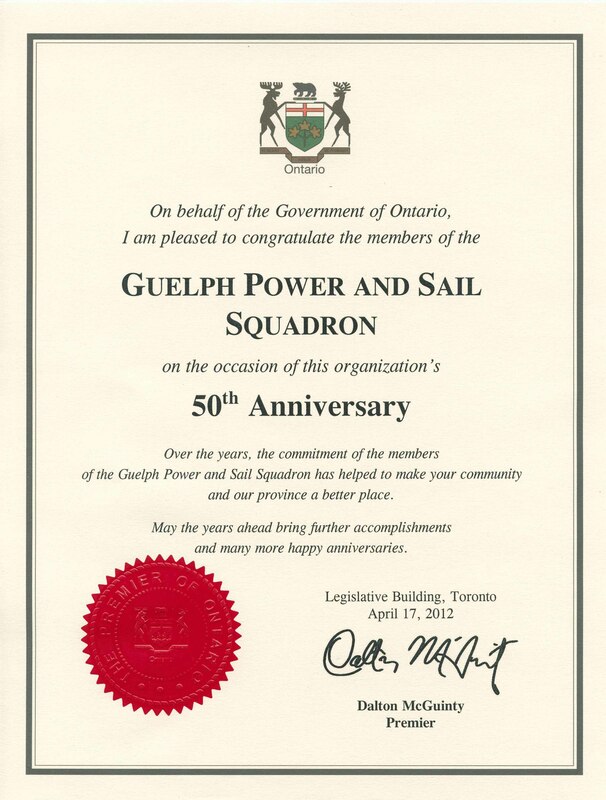 The Guelph Power and Sail Squadron is a unit of the Canadian Power and Sail Squadrons. 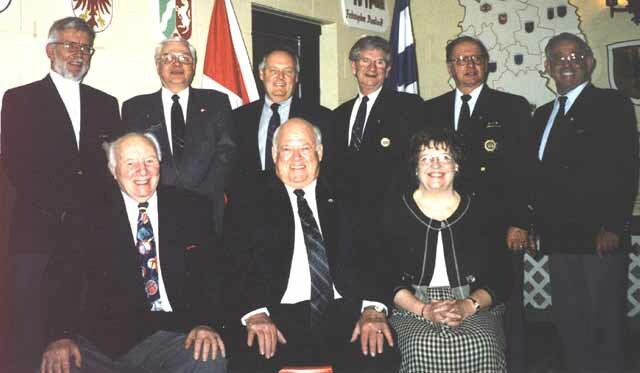 The National Organization is made up of 20,000 members from across Canada. These members are recreational boaters who are dedicated to boating education and safe boating. The Squadron is a volunteer, non-profit organization that provides boating courses to recreational boaters in the community. Boating courses range from basic boating skills to advanced navigational courses. For more on the CPS courses being offered in Guelph, please visit the Boating Education page. The CPS flag has represented boating competence in Canadian waters for over 75 years. The CPS flag is the one displayed on the upper left of our web page, while the new Guelph Squadron burgee is displayed on the upper right. The Guelph Squadron is also a community of enthusiastic recreational boaters who enjoy sharing their boating knowledge and experience with fellow boaters. Our What's New? page is updated regularly with details of upcoming events. 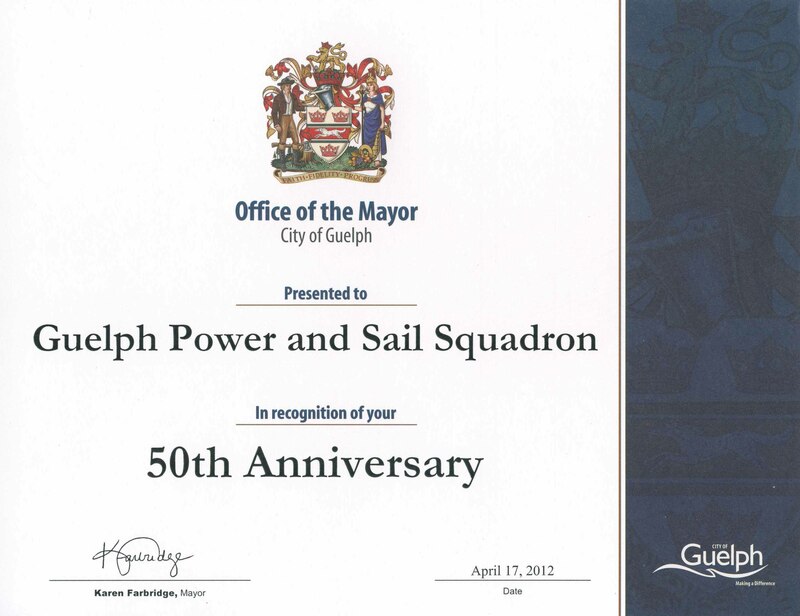 The Guelph Power and Sail squadron is one of 10 Squadrons that make up the Niagara District. In 2012, we celebrated our 50 th anniversary as a Squadron. On the evening of Saturday, September 29th, 2012, we celebrated our 50th Anniversary with a dinner. The dinner was held at the Victoria Park East Golf Club on Victoria Road in Guelph. 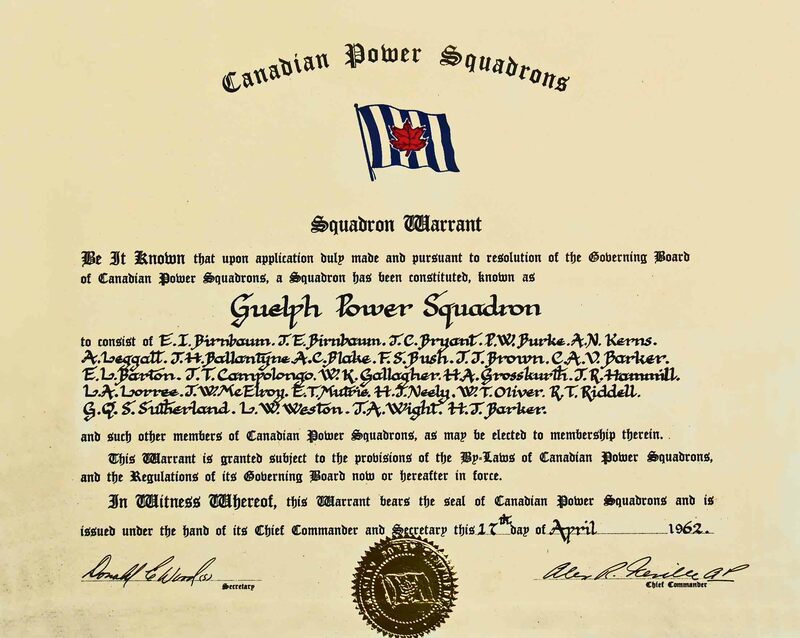 The Guelph Power Squadron Warrant was issued on April 17 th, 1962. 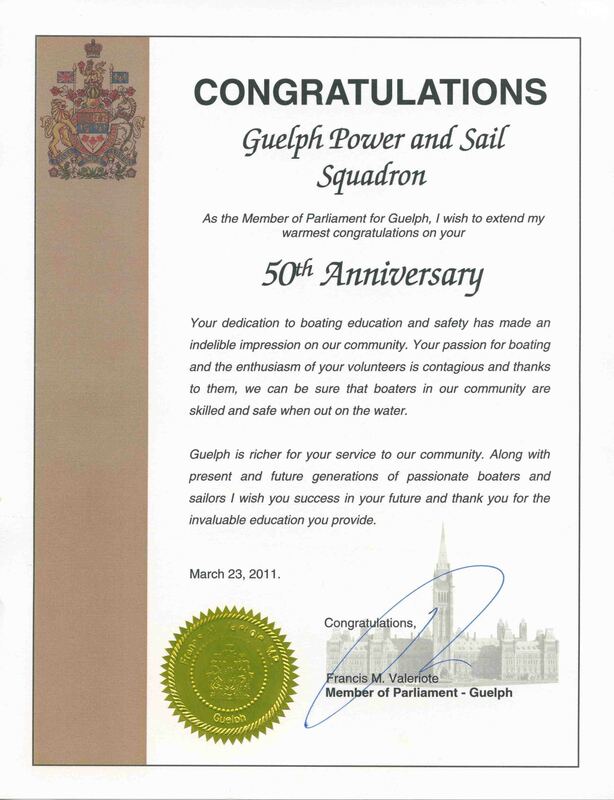 The Guelph Power and Sail Squadron is a non-profit community organization, made up of volunteers who are dedicated to boating safety through training. Squadron volunteers have been providing Boating Courses to boaters in the Guelph area for 50 years. In 1987, when the Squadron was preparing for it's 25th Anniversary, enquiries went out to some of our members to resurrect some of our history. The following is one of the responses that was published in the May 1987 issue of the "Blinkin' Buoy". Art Leggatt was the Guelph Squadron's first Commander. Delighted to get your letter concerning the origin of the Guelph Power Squadron, sorry that I will not be much help to you. Carol and I have been stirring up memories from the mental oblivion that exists of that time. The list of charter members that I have amended in only one or two places, even with Carol’s help, I can’t recall any more. Now for the start of Guelph Squadron. Carol and I and Manny Birnbaum had taken Piloting from the Kitchener Power Squadron. We both enjoyed it so much that we joined the Squadron and enrolled for their course in A.P. Here we met Gus Bryant who at that time was a member of the Kitchener Squad, as were Carol and I. Gus gave the course in A. P,. alone and we enjoyed it very much indeed. In fact the following year we renewed our membership and I took engine maintenance while Carol took meteorology. Among the friends we made in the Kitchener Squad was Drew Riddle M.D., J.N., who approached Gus and I about forming a Squadron in Guelph under the sponsorship of the Kitchener Squad. He and John Baetz, another officer of the Kitchener Squad offered their assistance. I am pretty hazy about events for now but we managed mainly with the help of Manny Birnbaum to get a nucleus of backing for our Piloting Course to be given in Guelph under the auspices of the Kitchener Squadron. I was appointed Training Officer Pro-temp. Drew Riddle, sometimes accompanied by another officer from the Kitchener Squadron attended all the classes and usually had a few encouraging remarks to add to the class. Following the outcome of the exam, the successful candidates were convened into a meeting sponsored by the Officers of the Kitchener Squadron in order to select a slate of officers for the Guelph Squadron. At this meeting the Guelph Squadron was born and I had the honor of being appointed the Commander. As an item of news, at our first meeting of the executive, when we discussed whether we should have a publication and Manny Birnbaum, who was Lt Commander not only volunteering putting out the first issues but also suggested Blinkin’ Buoy as its name. I hope the information will be helpful. Good luck to you in whatever you are planning in doing to celebrate the 25th Anniversary. 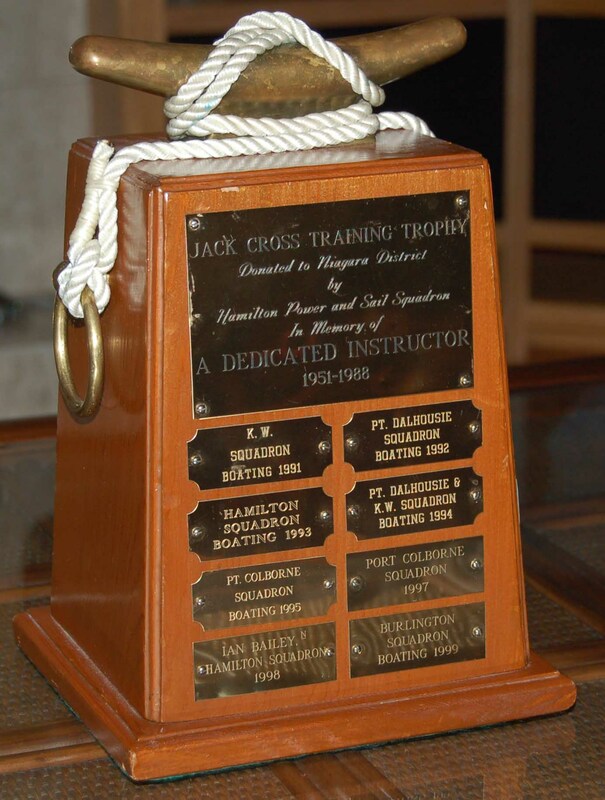 At the 2013 Niagara District Annual General Meeting, the Guelph Power and Sail Squadron was presented with the Jack Cross Training Trophy. The Jack Cross Training Trophy is one of several awards that have been set up by the Niagara District to recognize those Squadrons within the District, that have had successes in specific areas. 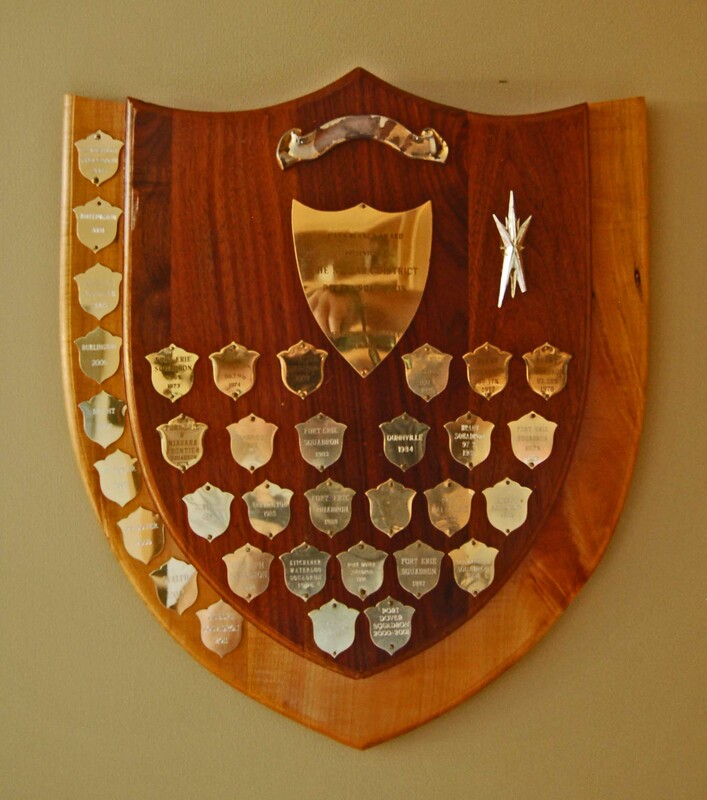 This Trophy is awarded to the District Squadron or individual that have excelled in a selected aspect of training. This year's choice was based on the number of students and the number of courses relative to the size of the Squadron. This award has been around since 1990 and was also awarded to the Guelph Squadron in 2003 and 2011. 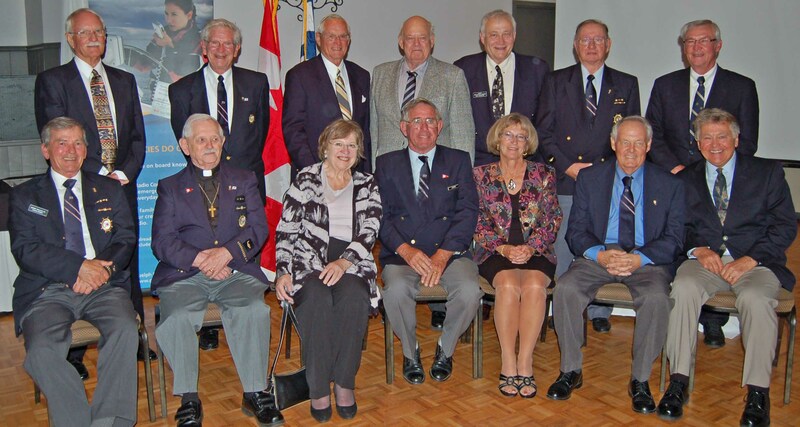 At the 2012 Niagara District Annual General Meeting, the Guelph Power and Sail Squadron was presented with the Merle Smith Award. The Merle Smith Award is awarded to the District Squadron that has excelled in some aspect of Information Technology. The 2012 award was presented to the Guelph Squadron for their effective use of Information Technology in Squadron Communications. 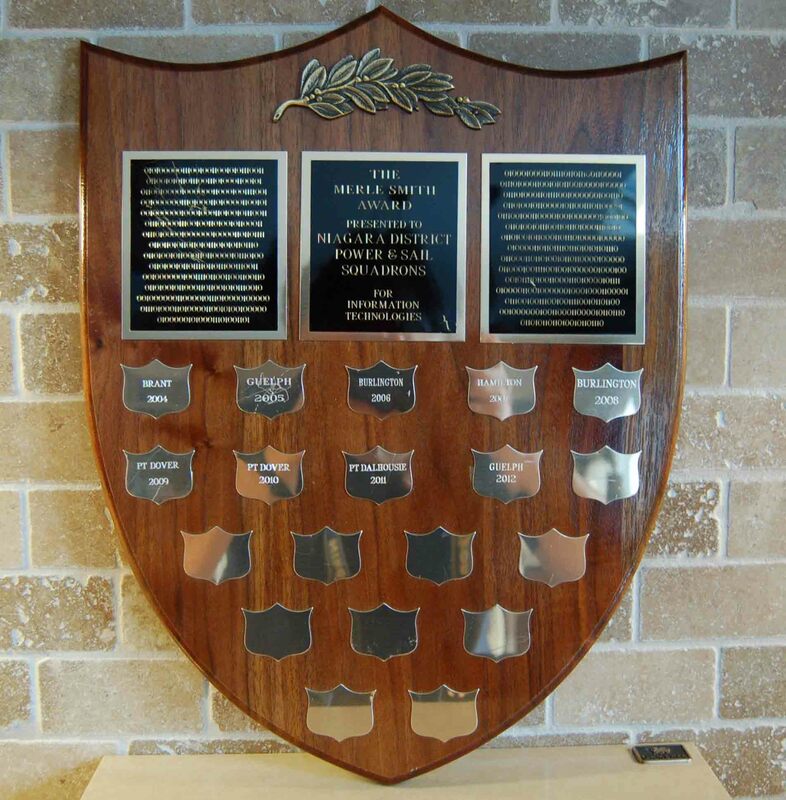 This award has been around since 2004 and was also awarded to the Guelph Squadron in 2005. At the 2012 Niagara District Annual General Meeting, the Guelph Power and Sail Squadron was presented with the Casa Blanca Award. The Casa Blanca Award is one of several awards that have been set up by the Niagara District to recognize those Squadrons within the District, that have had successes in specific areas. The Casa Blanca Award is also known as the Membership Loyalty Award and is awarded to the District Squadron that has shown the highest membership renewal numbers in the past year. This award has been around since 1973 and was also awarded to the Guelph Squadron in 1974, 1993, 1994, 2010 and 2011. 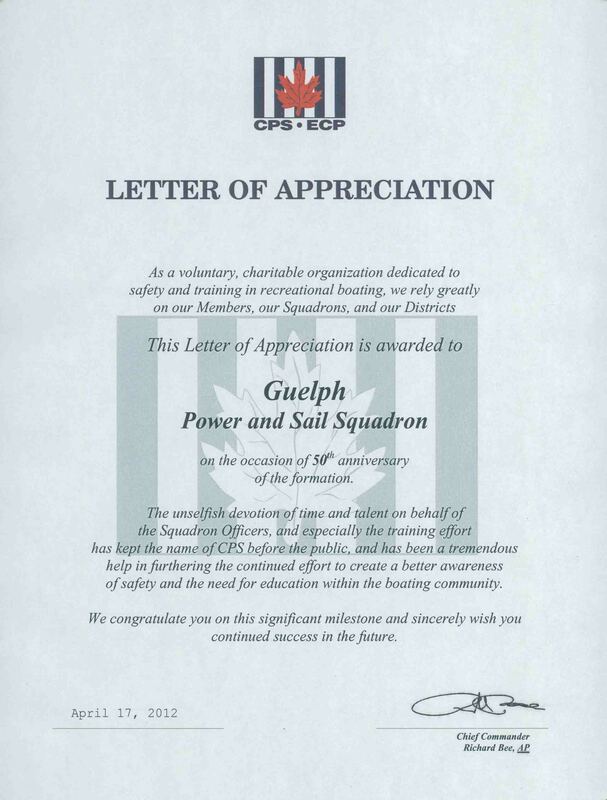 In 2002, the Guelph Power and Sail Squadron celebrated it's 40th Anniversary. (Back Row) from left; Charlie Stevens 1982-83, Gordon Ellis 2001-02, Art Hawkes 1996-98, Mike Seitz 95-96, John Ensing 1994-95, Fred Looker 1988-89. (Front Row), left, Dennis Butterworth 1981-82, Joe Goetz 1980-82 and Heather Fitzimons 1987-88. The Guelph Power and Sail Squadron pennant ( burgee ) has a white eight-spoke ship's wheel and an Edwardian like crown superimposed on a red field. Centered in the ship's wheel, the crown is a symbol which has been used for many years by the City of Guelph, the Royal City. 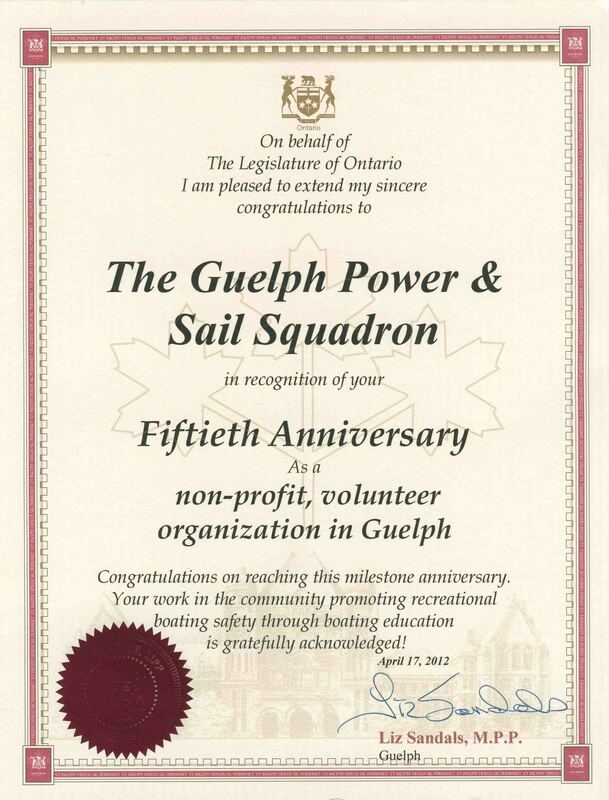 In 2012, the Guelph Power and sail Squadron is celebrating 50 years. To mark the 50th Anniversary, a gold bar has been added at the header. 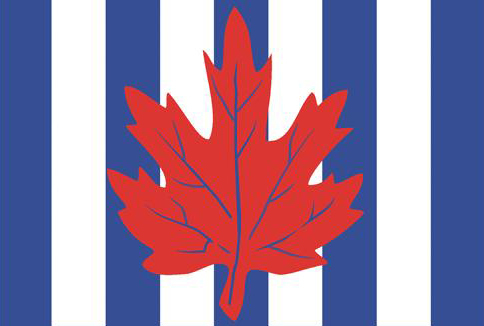 The Niagara District Pennant. The five blue bars of the of the CPS flag fall into the shape of Niagara Falls. The 12 bars of the escarpment represent the 12 squadrons of Niagara District. The official CPS leaf is centered in between the falls and the 12 bars. As of 2013, there were 10 Squadrons in the Niagara District.